MackieMade Paper Creations: Love and a chalkboard! Hello! 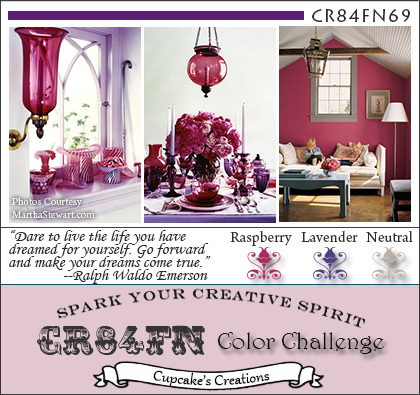 We are in week two for the current CR84FN Color Challenge!!! This week I wanted to try my hand on this new trend in the stamping world called the chalkboard technique. I know, I know...you've never seen a pink chalkboard! But I wanted to use our yummy colors from our current CR84FN challenge! AND...I wanted to make a sweet Valentine's card!!!! This chalkboard technique was so much fun! I will definitely try it again! If you are interested in this technique, go check out Betsy Veldman's tutorial for the current Make It Monday Challenge. It is a combination of heat embossing, a white watercolor pencil and sponging with some white ink! Of course, I had to add some romance to the card, so I added lots of Prima flowers and a paper doily. come play with us at CR84FN!!!!! I love your pink chalkboard Mackie, its such a wonderful idea and a cool technique too! Gorgeous flowers, and I love the winged heart stamp and sentiment. Oh this is just gorgeous!! Love the embossed background and I think the pink chalkboard is fab! Love the winged heart! Such a pretty card Mackie! Love the chalked background and embossed layer! This is beautiful Mackie,love the doily peeking out and your pretty little blooms! Love your twist on the chalkboard...looks dab on pink!! Love the embossing and doily!! Mackie, your colors are devine! Perfect with the doily. Love how you slanted it a bit too! LOVE your pink chalkboard, Mackie! What could be more Beautiful!!! Pretty flowers and embossed background, too! LOVE it! The chalkboard look is awesome Mackie. The colors look so good together... loving the pretty flowers. this is sooo cool! love your chalkboard technique in the pinks and purples!